Significanlty reduced travel time and cost, and eliminating the danger of driving on snow. Higher committee member attendence can lead to wider medical use. The Aomori Prefectural Federation of Democratic Medical Institutions holds regular meetings with hospital administrators and physicians twice a month, but there have been many concerns. First, travelling to the meeting site imposed a safety risk. In Aomori Prefecture, major urban areas are scattered, so some people had to drive about two and half hours to the meeting site. Driving on roads that are thickly covered with snow in winter is especially dangerous, thus raising the concern for driving safety. Driving also increases fatigue. Since board meetings often lasted from early evening until late at night on a weekday, many hours of driving could affect the work of the participants on the following day. Thus, many people requested improvements in the way the meetings were held. Although the head office of the Federation paid compensation and travelling expenses to people attending the meeting, reducing expenses by improving operations was a priority issue. In view of this, the Federation began considering the installation of an HD Visual Communications System in order to efficiently hold meetings without requiring people to travel to distant locations. The Federation of Democratic Medical Institutions is one of Japan's leading organisations of medical institutions and has about 20 member institutions in Aomori Prefecture. It is devoted to helping physicians and nurses achieve non-discriminating, integrated medical services so that everyone can receive safe and reliable medical treatment and nursing care at anytime, anywhere. To prevent the collapse of regional medical services, the Federation focuses on increasing the number of doctors and nurses, with the cooperation of many medical professionals and local residents. The Federation is presently planning to increase the number of connected bases from the current three in order to hold meetings more efficiently in the future. 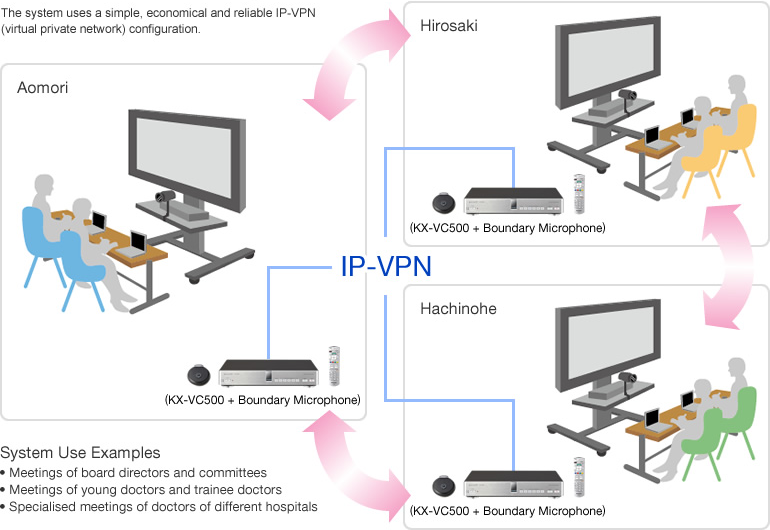 In addition to the high-quality images and sound of the HD Visual Communications System, a proposal for a reliable IP-VPN line plan that featured both economy and ease of system introduction was a key point in the installation decision. We held a total of three demonstrations. In the last two demonstrations, we actually set up the system and connected three Federation bases as requested by the Federation. In the final demonstration, a regular board meeting was held using the HD Visual Communications System. This demonstration created such a strong impact that they made the decision to install the system on the spot. By proposing a communication line plan with the cooperation of a specialist partner, we were able to quickly suggest a suitable scheme to meet the customer's requirements. By connecting three bases, the HD Visual Communications System has successfully achieved significant reductions in the time and cost of travelling by car. In addition, it has minimised the safety risk of driving on snow-covered roads in winter. The HD Visual Communications System has eliminated the need for participants to take business trips to attend not only the regular board meeting but also many committee meetings, thus facilitating the adjustment of participant schedules and increasing attendance. Presently, the HD Visual Communications System is effectively used in meetings that are voluntarily held by young doctors and trainee doctors. It is also used in specialised meetings of doctors at different hospitals. As such, the system is used for highly diverse applications.